With Sony doing it's own Super Smash Bros. type game with PlayStation All-Stars, Xbox-loving commenter rbranyan3to wonders if it wouldn't be impossible for Microsoft to do the same. How would it work? Let's brainstorm in today's Speak Up on Kotaku. I was reading online about the Playstation All-Stars game and in the comments people were ripping on Microsoft and say that they couldn't even make a game like that since they have no exclusives or decent IP's. I did some thinking, I think Microsoft could pull it off and have it be totally awesome. 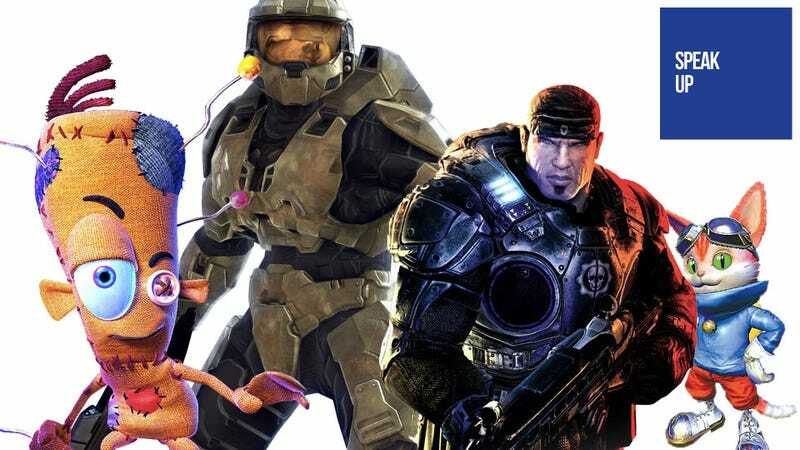 Characters would include, Master Chief (of course), Arbiter, Marcus Fenix, Banjo, Conker, The Gunstringer, Alan Wake, Splosian Man/Ms. Splosian Man, Reaver/other Fable character, Frank/Maw and that's just off the top of my head. Maybe they could get some third party games that either were exclusive at one point like Mass Effect 1 and Shepard or Call of Duty and Soap. Maps and locations could include Halo/Covenant ship/UNSC ship/etc., Albion, the Old West, Brown and drab Gears location, Citadel if they do the third party characters, Bright Falls. I have always preferred Xbox over Playstation and I would LOVE a title like this.